Stress and challenging experiences leave some residues in our body. These residues accumulate and, unless we learn to evacuate them, we end up living, often without being aware of it, in a state of chronic tension. Over time, these residues from stress alter our neuro-physiology, compromise our health, jeopardize our well-being, and impact the quality of our relations with others. We have an innate, natural mechanism to release that stress and bring ourselves back to balance. TRE, founded about 20 years ago in the United States by David Berceli, an international trauma expert, allows us to activate that innate mechanism and release the deep chronic tensions resulting from stress and traumatic events in our lives, naturally. All human beings have an innate ability to recover from traumatic experiences. TRE allows them to access that ability again. The method was originally intended to bring relief to people affected by deep trauma, however, in today’s world, we can all benefit from stress release and improve the quality of our life. A set of simple exercises allow us to let some tremors and vibrations emerge, which, when practiced safely, allow our body to naturally release deep tension. Letting go occurs naturally. These therapeutic tremors are an innate, natural mechanism of autoregulation that we have in common with all mammals. They allow us to let go of myofascial tensions, neutralize the effects of stress, calm and balance our nervous system. The tremors are generally experienced as very enjoyable and liberating. After each session, you will experience a state of deep relaxation. You will feel at peace. In a class we will discuss how TRE® works, and you will get a chance to share your needs and questions. You will then be led step by step through the exercises, and assisted in your own experience of the therapeutic tremors. By the end of the class you will be feel a greater sense of peace and wholeness. ​Call me, I'll be happy to answer. 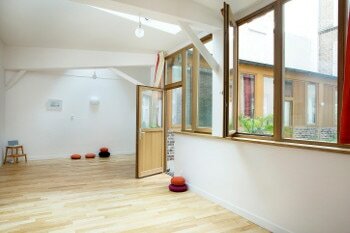 Individual sessions or small group workshops in Paris.